This autumn promises to be a time of change for Wimbledon Space when, after more than a decade, the gallery moves to a new location at Wimbledon College of Arts. From October 2017, the gallery will re-locate to the college’s original 1930’s building entrance and foyer. This new gallery space, in the hub of the college, will refocus the programme to stage a dynamic range of exhibitions and events in a more interactive space, showcasing Wimbledon as a centre of excellence for arts and performance in the post-digital age. The move will also mark the start of a new annual programme entitled Against Static: Technologies and Processes of Drawing, which will see four exhibitions in total take place before June 2018. Each exhibition will aim to scrutinise and question the processes and technologies of contemporary drawing, and the resulting relationships with trans-disciplinary engagement. With so many possible technologies, tools and processes for making drawings, the question is raised: what counts as drawing, for what purpose and for who? Thing: A Residency of Collaborations. The exhibition is initiated by members of Drawing Connections, a group of artists who have chosen to work collaboratively through the medium of drawing as a way to challenge individual practices and investigate how artists communicate and collaborate. Esperanza Perkins, Memories Series 1, 2017. Pencil drawing on fabric with white crocheted thread, 20cm x 25cm. This series of collaborative residencies will playfully question the individual practices of artists and perceived notions of what drawing can be. For two weeks, a succession of ‘mini residencies’ of established collaborative pairings will unfold, creating new work in response to the gallery and college environments. With overlaps between collaborative groups and through the renegotiation of space, the potential for new interactions and the sparking of fresh conversations is fertile. We spoke to four of the artists taking part, Tony Blackmore, Camilla Brueton, Alison Carlier and Esperanza Perkins, about their expectations for the exhibition, and how they hope that working collaboratively will broaden their understanding of what contemporary drawing can be. can you start by telling us a bit about your own background and practice with relation to drawing? 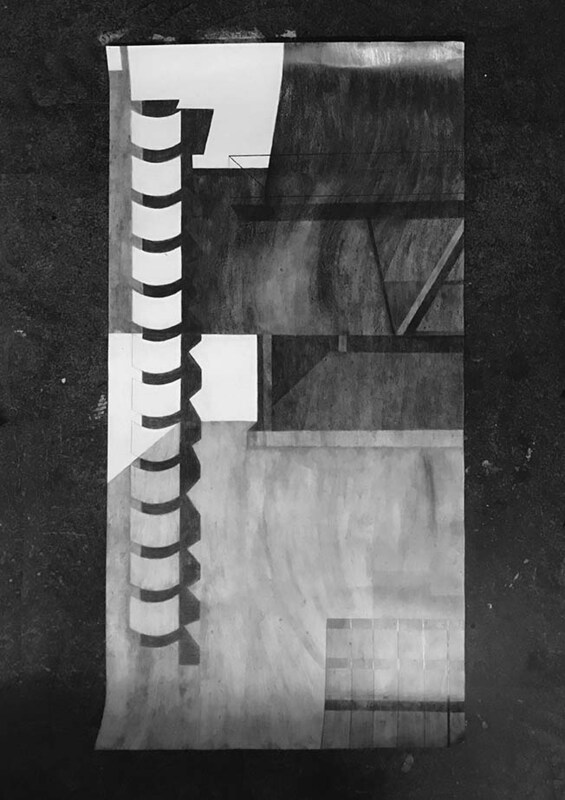 Camilla Brueton: Drawing has always been an integral part of my practice. Cities and infrastructure fascinate me and whilst I was studying BA Sculpture at Kingston, I developed a site-specific practice that was largely installation-based. Back out in the real world, I began to explore urban space through interaction with people, historic archives and the physical environment around me. Wanting to examine and push my practice further – wanting to interrogate why I was often attracted to bleak spaces many would overlook (multi-story car parks, modernist housing estates, train platforms…) I embarked on the MA Drawing course at Wimbledon (2012-14). This gave me the space and support to reflect on, push and contextualise my work, both theoretically, but also practically, in an interdisciplinary environment. Drawing is now much closer to the surface of the work I make, although when given the chance, it often spills off the paper, into the space around it. Alison Carlier: Like most people I’ve drawn all my life, but on completing my BA Fine Art at University of the Creative Arts (UCA) in 2002, I realised that drawing worked as a centre for my practice to orbit around. I went on to graduate in MA Drawing at Wimbledon in 2013 and then to win the Jerwood Drawing Prize in 2014 for a sound work entitled Adjectives, Lines and Marks. I hadn’t especially been working with audio up until that point, but my interest in the closeness of the drawn and the written mark led me to using the voice in ‘audio drawings’ where the text could be analogous to drawing…maybe only reminding the listener of drawing, putting them in that space. I’m particularly interested in testing the edges of drawing, as a fluid and open-ended medium. Alison Carlier performing an Audio Drawing at Art Language Location, Cambridge. Photo by Bill Mudge. Esperanza Perkins: My maternal Spanish grandmother taught me how to crochet when I was a child. My mother, grandmother and I would sit together crocheting, knitting or sewing. It was a way to communicate, pass down knowledge and to strengthen our bond as a family. Today these memories live on in my artwork, carrying on the connection to my family and to my family’s history by using pencil drawing and crochet thread (often using thread that belonged to my mother). 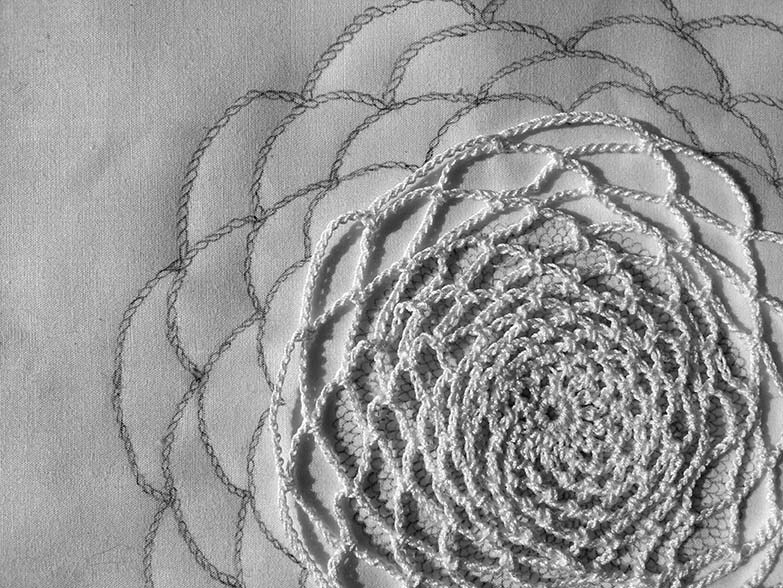 I see crochet as drawing with thread – holding many memories – and my approach to drawing is very much like crocheting: sketching in a circle anti-clockwise with the continuous thread and the continuous pencil mark emulating each other. 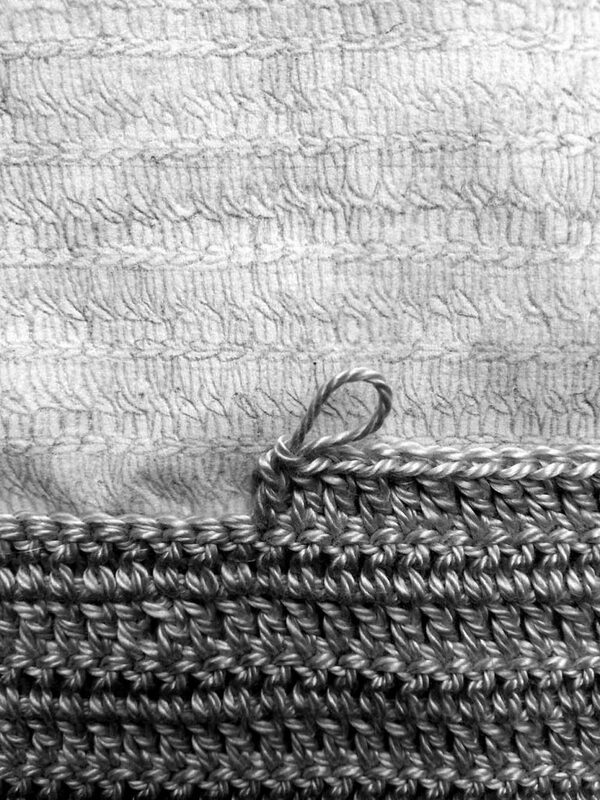 The repetition of the stitch and mark-making reflects the repetition in our relationships and daily lives. The loops unify and create a bond, whilst the crochet thread signifies the thread of life, the thread of connectivity. Tony Blackmore: After completing MA Fine Art at Wimbledon in 2013 I started to make work, which I continue to make today, that involves folding drafting film into surfaces that resemble geometrically formed ‘landscapes’. The process to make each piece starts with creating an underlying composition that is based on a grid where lines distort and intersect with variable frequencies. These are similar to constructive interference or moiré patterns. Always drawn in pencil and not using computers, I have experimented with these underlying compositions by varying the size, angle and the spacing of lines until the right tertiary pattern is formed from which to create an undulating folded surface in drafting film. By mapping and scoring the composition onto drafting film a second drawing is created from which I can manipulate a 3D surface. At this stage I feel I am transforming an image created from scored lines to an image created with light, shadow and reflection. For me, the collection of underlying compositions creates an interesting body of work in itself that appears to be almost scientific in its exploration. Separately, I have also created folded surfaces with graph paper and flute paper where instructions for folding and size of angles etc. are included in the final work to provide a map of the process from beginning to end. Tony Blackmore and Fiona Grady, Light Intersection, hARTslane Project Space, 2016. Can you please tell us about Drawing Connections and how your involvement in the group has impacted your practice? Esperanza: Drawing Connections is a group of artists working together using drawing to challenge our individual practices, explore how artists communicate and collaborate, and challenge what contemporary drawing can be. My involvement in the group has enriched my practice in many ways, from developing and pushing the boundaries of my drawing with crochet to expanding the way I research my subject matter. This has been possible through collaborating with other artists and sharing their approaches to making and experimentation through which we have formed good and supportive relationships that have been invaluable. Tony: To me, Drawing Connections has always been about being open to exploring new ideas, either within our collaborations or through discussion with others. It’s exciting that we are now starting to see the development of distinct styles within fixed collaborations independent of the artists’ individual practices. Camilla: Drawing Connections has challenged me to connect with other artists, to initiate sharing and collaboration. It has made me look at places in a different light (my first collaboration sparked a drawing of a Tudor tower block), taken me to places I wouldn’t have made work about on my own, from a nature reserve to renderings of physical space and architecture located online. Working as part of such a large artist-led group has also taught me about the power of the collective. We are more than the sum of our parts, and thus an interesting proposition. Alison: This is my first time to collaborate and show with the group, so it’s new territory for me. Camilla Brueton and Lisa Solovieva, Untitled, 2017. Do you have plans for your ‘mini residency’ and who will you be working with for this? Tony: I will be working with Fiona Grady on what will be our second exhibition collaboration together. Both of us are excited by the prospect of making free-standing sculpture with photographic filter gels that interact with artificial and natural light. Camilla: I will be collaborating with Lisa Solovieva at Wimbledon. We haven’t yet discussed exactly what we will be doing, but it will be a continuation of our investigation into ‘virtual architecture’. I’m excited about having the opportunity to be in the same space as Lisa over a sustained period of time – even three days sounds like a luxury compared to our usual working schedules! We live on opposite sides of London, we both share studios with others – and whilst we collaborate, we usually tend to work remotely. Alison: I will be working with Jill Evans. We graduated together in 2013 and have collaborated before in a pop-up residency in an un-let shop, so we know about how each other works and we give each other space to test things out. Our work will feature marks on paper, audio and possibly text. Esperanza: I will be working with Sharon McElroy. We have already met to talk through some ideas of how we may approach the residency, what materials we may use and how we may display them. We both have an interest in textiles and we may explore drawing with fabric. We look forward to responding and being inspired by the space in which we will be working. What do you think working with another artist will mean for your practice – is this something you usually do or is this new for you? Camilla: Working with Lisa has been refreshing and a challenge (in a good way). I have collaborated with others before, as part of the Drawing Connections project, but also a group of six artists called Point and Place, with whom over the past 16 years I have made an artist’s book and a game. I think the difference with Point and Place is that whilst it is also very experimental, we work towards a collective outcome, negotiating the form and content as a group. Here, with Drawing Connections, we have something called ‘drawing’ we can play with – where it takes us is still being discovered. What all my experiences of successful collaborations have in common, though, is trust and generosity. You have to trust the person/people you are collaborating with, and have a mutual sense of generosity towards each other. Esperanza: I had not collaborated before being part of Drawing Connections, but I have since collaborated with Sharon McElroy within the group and we have been working on projects for the past year. There have also been exhibition opportunities outside the group as a result, which has reinforced the success of my collaboration with Sharon. Collaborating brings its own challenges from agreeing on a concept through to jointly steering the development of ideas, down to refining and being happy with the final artwork and installation. But it does bring its rewards, too, as working with another artist enhances my practice, in terms of feeding back either drawing processes or some of the ideas explored. Alison: I’ve recently spent a year collaborating with artist Amanda Loomes on an audio work for a Rose Garden in Southend-on-Sea called Spiky Black, and I have loved what collaborating can bring to the table: it gives your practice a temporary buoyancy. It’s great if you can be honest with each other and gently challenge the other person if something doesn’t feel right. You really have to be able to accept each other and get on! Tony: Working with another artist is very new to me and my practice and probably a long time coming! I have found it involves having a real sense of trust in each other. I would collaborate again but to have that trust with a fellow collaborator one really needs that common hinge-point or hook that excites you both, and a confidence that you can create something unique together. For Fiona and I, our common fascination is the potential and capabilities of drawing with light. Esperanza Perkins, Memories Series 2, 2017. Pencil drawing on fabric with white crocheted thread, 21cm x 30cm. Do you have any thoughts about how the new venue for Wimbledon Space might affect the outcome of your time there and the exhibition? Alison: Despite Wimbledon Space moving from the ‘white cube’ space, I think for us, it’s more freeing. Working outside of that traditional gallery space makes you think more about the site which can never be separated from the work anyway. Esperanza: The new venue, with its interesting spaces, will be inspiring to work in and interact with – something I have not done before as I usually make work at home, exploring familial relationships and experiences. I will also look forward to seeing how this will impact my practice from working relatively small in scale to working on a larger scale and on site. The exhibition will be an engaging and diverse showcase of our responsive collaborations. Camilla: It’s a challenge, and a different space from where we first thought we would be exhibiting, but it has encouraged a more experimental approach and opened up the opportunity of spending time together, on site, for both myself and Lisa, but also with the wider group. Tony: Immediately I think of factoring in the passing movement of the viewer. But, of course, that will be open for discussion! A Many Sided Thing: A Residency of Collaborations runs at Wimbledon Space’s new location from 16 – 27 October 2017, with a drinks reception taking place on Thursday 19 October, 5 – 8pm. Find out more on the event page.